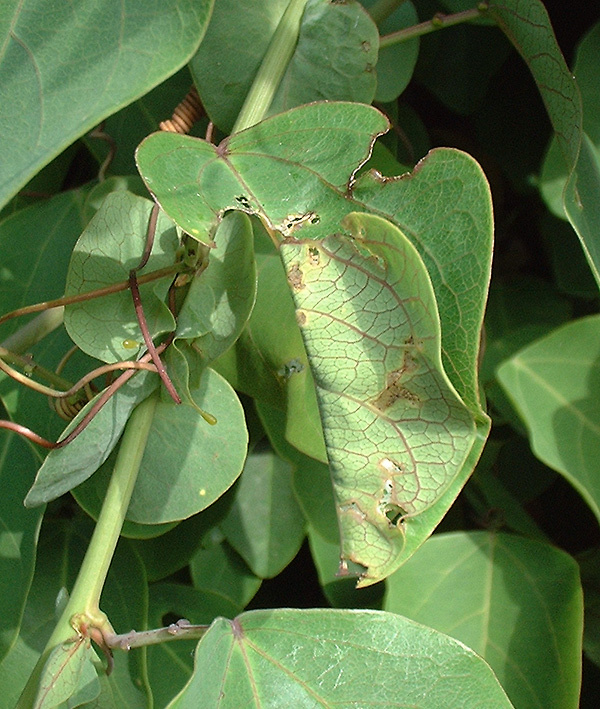 In the garden or nursery it is more likely that any moth caterpillar damage is caused by leaf rollers. See below. The only picture in the world, as far as I know, of a hawkmoth, family Sphingidae, visiting a passion flower. 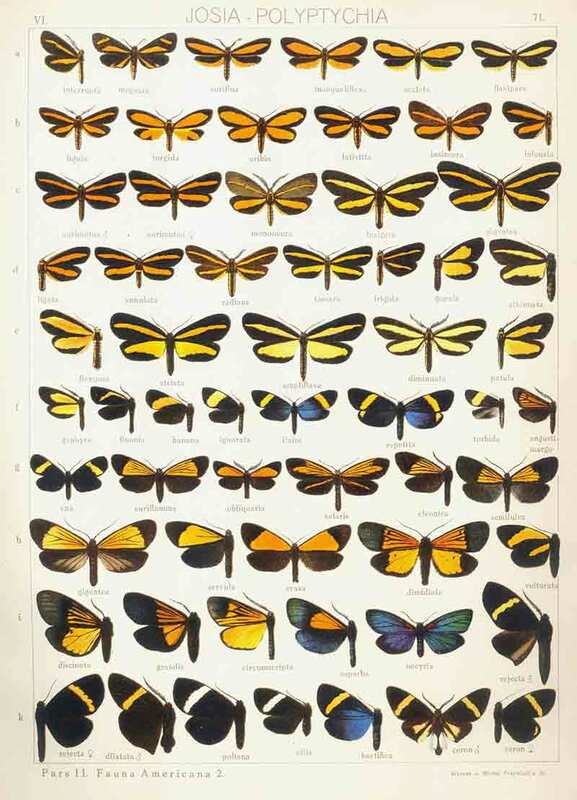 This family of moths have long narrow forewings capable of powerful flight and can hover over flowers to feed. It is unclear whether as a result of its visit it successfully pollinates the flower. Many thanks to Ivan & Marlies Sazima for this extraordinary picture. Leaf rollers, the caterpillars of some Tortrix moths, can cause a great deal of damage to small Passiflora. 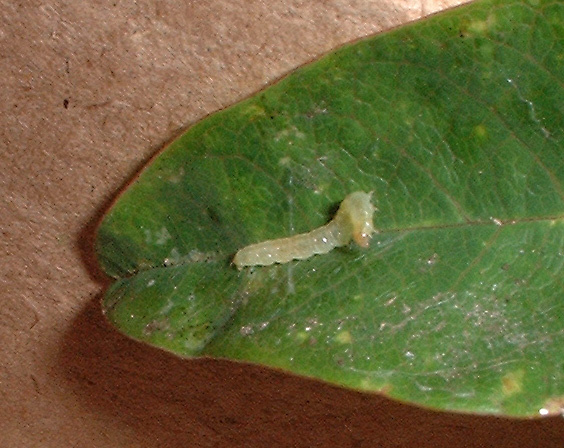 The life cycle is- Moth – Eggs – Leaf roller caterpillar – Pupa – Moth. Damage is easy to spot as the leaves are rolled up into a tube, or if too stiff flattened as in the P. actinia leaf above. The caterpillar will turn into a small brown pupa hidden in the leaf which will then emerge as a small brown moth. Best policy is to tear off the rolled up leaves if the plant is small and suffering badly from the damage. You have to be quick though as otherwise the leaf rollers will bale out and absail down their silk threads to vanish into another part of the plant. Larger plants with just a few rolled leaves need no treatment at all. I accidentally found one effective treatment when I gave quite a strong foliar feed to a young Passiflora and the next day found a dozen leaf rollers in the surrounding saucer-they clearly did not like the taste! Small Leaf roller at work on a P. ‘Purple Haze’ leaf. 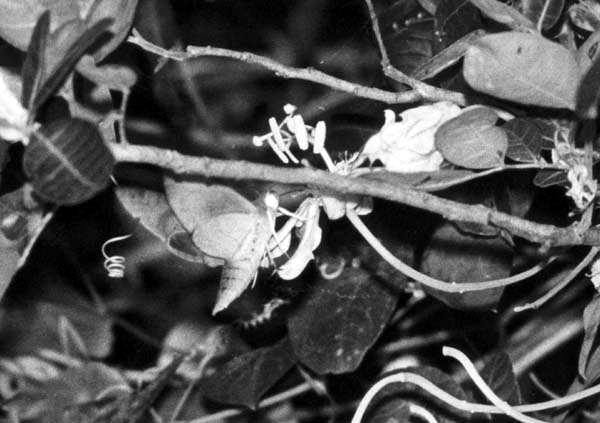 The head is slightly blurred as it is swinging rapidly back and forth across the leaf laying down fine filaments of silk. You can see a thread that it has just done half way down across its body.